The new Senior Physics text for Queensland schools is now here. 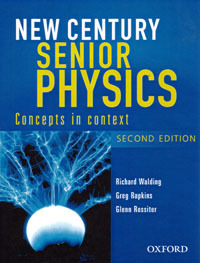 Author New Century Senior Physics textbook by Oxford University Press. This web page has links to the Queensland Senior Physics Resources or the OUP (2nd ed) New Century Senior Physics textbook.